One of my regular haunts on the Web is the NASA Earth Observatory, which publishes pictures of the Earth taken by astronauts in space. As a solar eclipse took place yesterday (which wasn’t visible in Europe, unfortunately), the Earth Observatory published two pictures of past eclipses. One of the two pictures is a remarkable image of what the shadow of the moon looks like on the surface of the Earth from space: an ominous black bruise on the planet, like a harbinger of the apocalypse. Besides the unusual perspective, the photo interests me because I got to experience that particular eclipse in person. 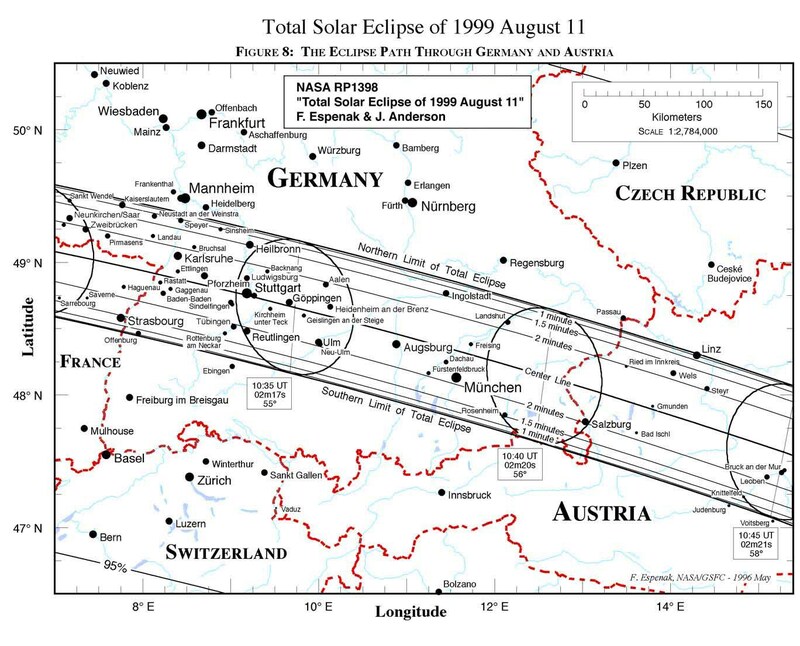 In August 1999 I was living in Freiburg, Germany, just south of the path of totality. For weeks leading up to the eclipse on August 11, Germany had eclipse fever: people planned eclipse parties, protective glasses were sold everywhere, and the television was awash with shows telling you how to build your own eclipse viewer with cardboard and paper - and warning you that you’d burn your eyes right out of your head if you were foolish enough to look directly at the sun without your special glasses. Jeremy and I made plans to drive north with some of our friends to get into the path of totality on the day of the eclipse. Unfortunately, I waited way too long to buy my special glasses and was subsequently laughed at by every optician and pharmacist in Freiburg for thinking there would be any glasses left on the day before the eclipse. The second - and much more dire - problem was that August 11 dawned cool and overcast. Despite the clouds, we set off with our friends in the morning and headed north. Of course, everyone else in southern Germany had precisely the same idea, and the Autobahn was full of eclipse-chasers flocking north with their picnic baskets and eclipse glasses. The traffic didn’t hold us up too much, though, and just a few hours later we ensconced ourselves in a public garden with crowds of other people. In the hours approaching the full eclipse, we all eyed the skies dubiously. The clouds had broken up a bit, but the short periods of bright sunlight were punctuated with longer stretches of gloom. Eventually, the light began to dim even when the clouds had parted: the moon’s shadow was creeping over us. We passed a single pair of special glasses around between us to watch the darkness eat away at the edge of the sun. The gradual darkness brought on by an eclipse isn’t like the darkness of sunset or an approaching storm. The light doesn’t fade so much as take on a strange, flat quality. It’s as if the world is slowly being drained of all its color, desaturated. As the temperature drops, a breeze picks up, and the birds fall silent in the false anticipation of nighttime. It’s unsettling and exciting in equal parts - unsettling because it’s so unnatural for night to fall at midday, and exciting because you know you’re about to witness one of the most spectacular events nature has to offer on planet Earth. Well, it’s only spectacular if you can see it, of course, and as we neared totality, it didn’t look as though we would see much of anything through the clouds. I wanted to see the full eclipse so badly that my heart was racing, and I mentally willed the clouds to part and reveal what was left of the sun. Naturally, it didn’t work: right before the point of maximum coverage, the clouds thickened up, blotting out the last flare of sunlight from the “diamond ring” effect and dashing all my hopes. But then the shadow sweeps on, the sun blazes from behind the moon, and the world breathes again. The world breathes and cheers, in fact, applauding the cosmos for putting on a good show. Some of the more silly inhabitants of the world try to take pictures of the eclipse with their flash still on, temporarily blinding everyone around them at a really, really inconvenient time. But the rest of world finds it in their hearts to forgive them, because the sun is coming back out, and the apocalypse hasn’t arrived after all, and all is well with the universe.